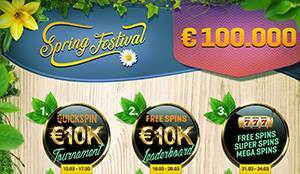 The online casino Guts is welcoming spring in style this year by offering nine special leaderboard promotions over the next month, with prizes totalling €100,000! There are nine different promotions, each with their own terms and time-frames, so make sure that you take a look at each of these promotions. If you take part in at least one of these promotions, you'll also take part in the main raffle with €20,000 in prizes. You can get free spins for The Grand slot by meeting wagering requirements with real money on selected slots, as listed in the promotional details. The winnings of those free spins will determine your position on the leaderboard, that will reward the best players with extra cash. You can get free spins for Pirate's Plenty by meeting the wagering requirements of qualifying slots with real money, as detailed in the promotion. Winnings from these free spins are wager free. This promotion is for Evolution Live Roulette and Blackjack tables, and you can collect points for the leaderboard by playing the games with €5 minimum real money bet. Climb the leaderboard by completing missions of three slots as quickly as possible. The missions are for the slots Vikings Go Wild, Golden Fish Tank and Holmes and the Stolen Stones. Climb the leaderboard by triggering the bonus features of selected slots. Participating slots are Wolf Gold, Great Rhino, Mustang Gold, Asgard and 7 Piggies, and you get 1 point for each triggered bonus feature. Climb levels in the qualifying slots Big Bad Wolf and Eastern Emeralds to collect tokens for features and free spins of the games, and collect 1 raffle ticket for the prize draw for each level you climb. Complete tasks at participating slots to collect points for the leaderboard. Tasks include getting a 3x symbol combination and triggering free spins and bonus games. Play any of the participating slots, as listed in the promotional details, with a minimum bet of €0.20 per spin to get the chance to win a random cash prize. Higher stakes also mean a higher chance for a win. To take part you have to first opt-in on the Guts website, in the details of the promotion, and then separately in every promotion that you wish to take part in. Each promotion also has its own terms, so make sure that you read them carefully before participating. Details and terms can be found on the website, general Guts bonus terms apply. Give Spring a Big Welcome at Guts Casino! Guts Casino is an established website that has been online since 2013, and aside from casino also offers poker and sports betting. You can find over 1700 games from some of the biggest names in the industry, including Betsoft, Microgaming, NetEnt, Play'n GO, NextGen Gaming, Yggdrasil and Amaya, but also many other developers. The casino offers new players from many countries a generous welcome bonus with attractive bonus terms, but what really makes them stand out from other operators is the withdrawal processing time, which is usually just a few hours. Find out everything there is to know about the casino in our detailed Guts Review, or take a look at our answers to frequently asked questions.